Click to enlarge. The cornice (oval) behind Buster Keaton belongs to the extant Coronet Apartments at the NE corner of 6th Avenue and W 58th Street (see oval below in modern view). The sign reads “Wilkes & Co Ladies Tailor,” that once stood at 37 W 58th Street. Bob Egan’s fascinating website PopSpotsNYC.com explores visual archeology similar to my own. But instead of looking at silent-era comics, his site concerns places “where interesting events in the history of Pop Culture took place; like album cover shots, places where movies and tv shows were filmed, and sites on which paintings were based.” I wrote Bob to say hi, and in response was surprised to learn that an early Bob Dylan album cover was shot on Jacob Street just around the corner from where Buster Keaton shot Film (1964) in the shadow of the Brooklyn Bridge, as described in my post Buster Keaton’s Manhattan Project. While I’m based in California, Bob visits the New York Public Library frequently, so when he offered to help me look things up, I mentioned the above scene from Buster Keaton’s 1928 feature The Cameraman, where Buster takes Sally (played by Marceline Day) out for a stroll. Beside her apartment is a sign for Wilkes & Co. Ladies Tailor. Bob quickly wrote back that Wilkes was situated at 37 West 58th Street in Manhattan, half a block from the Plaza Hotel. Harold Lloyd stayed at the Plaza when filming Speedy (1928), so if Buster stayed there too, this setting would have been a particularly convenient location for Buster to shoot. While Marceline’s apartment is long gone, the cornice of the extant Coronet Apartments appears behind Buster’s head. More fun, the Google Street View of this setting shows a contemporary camera crew shooting a movie at the same spot where Buster had filmed nearly 85 years prior. Click to enlarge. The urn-decorated third floor balcony of the back of the extant Steinway Building (box) appears behind Buster further west down W 58th Street, past 6th Avenue. The other buildings to the right in the vintage view all seem to remain standing. The oval marks the extant Coronet Apartment on the near corner of 6th Avenue. (C) 2012 Google. On close examination, it appears that all of the buildings behind Buster in the far right of the frame, on the block of 58th Street due west of 6th Avenue, are also still standing. The red arrow marks the point of view from Marceline’s apartment (small box) towards the Coronet. The purple arrows marks Buster’s path as he races in front of Bergdorf-Goodman, while hopping a low fence in front of the Pulitzer Memorial Fountain. The large red box on the right marks the now lost Cornelius Vanderbilt mansion, the future site to Bergdorf-Goodman. New York Public Library. When I looked at this map Bob also sent me, I realized that Buster had filmed an immediately preceding scene on the same block. Buster’s date with Sally begins when she calls to say she is free to see him. The joke is that Buster drops the phone, and races so swiftly on foot to her apartment, that he arrives there before Sally realizes he is no longer on the phone. Buster begins his sprint running up 5th Avenue, as shown in my prior The Cameraman post. But just prior to arriving at her place, reader Andy Charity discovered that Buster ran past the recently opened Bergdorf-Goodman department store facing the Pulitzer Memorial Fountain. We can see from the above map that Marceline’s apartment (left box) stood half a block from where Buster ran across the park (purple arrow). The rest of this post is an update of my story about Harold, Buster, Bergdorf-Goodman that ran last year. Towards the end of Harold Lloyd’s manic taxi-ride driving Babe Ruth up 5th Avenue in New York during Speedy (released in 1928, but filmed during the summer of 1927), they approach W 57th Street, and the final of five traffic towers that once helped to regulate traffic flow along this major thoroughfare. As I explain in Silent Visions, you can see at this corner the ongoing construction of the Bergdorf-Goodman store, built on the site of the former Cornelius Vanderbilt mansion. A stock footage shot of the mansion appears briefly during Buster Keaton’s debut feature film The Saphead (1920) (see further below). Scene from The Cameraman. The full panorama as Buster runs along W 58th Street from 5th Avenue. He skips over a low wire fence that was part of the Pulitzer Fountain Park. 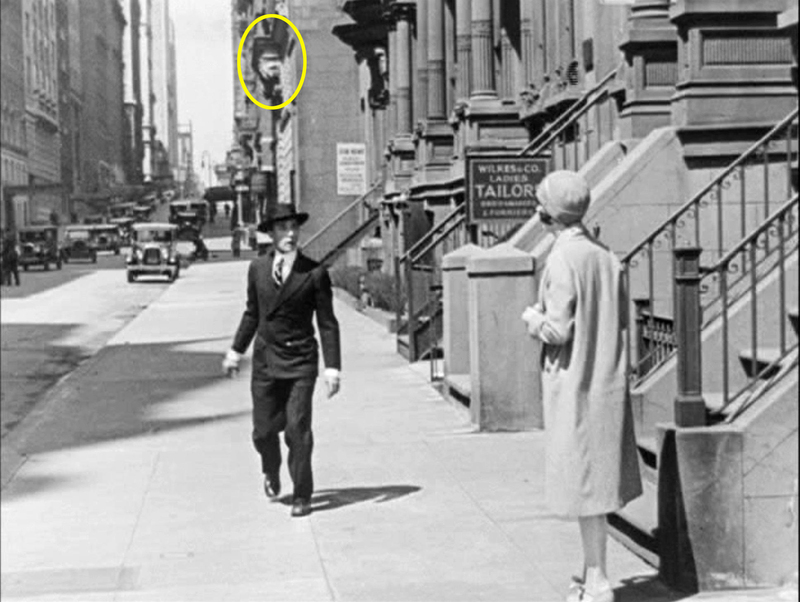 As shown here, eagle-eyed reader Andy Charity spotted that Buster Keaton ran west along W 58th Street from 5th Avenue, along the north face of the newly-opened Bergdorf- Goodman store, hopping over a short wire fence that was part of the landscaping for the Pulitzer Memorial Fountain across the street from the store. So here, for once, the geographic portrayal of New York was quite accurate. Coming west from 5th Avenue, Buster would have to pass Bergdorf-Goodman to reach Sally’s apartment further down the same street. Both views show the SW corner of 5th and W 58th. The Bergdorf-Goodman store was built on the site of the Cornelius Vanderbilt mansion, shown as it appears in The Saphead (1920) to the right. The arrow marks the same relative spot, while the corner of the Pulitzer Fountain Park appears in the lower right corner. 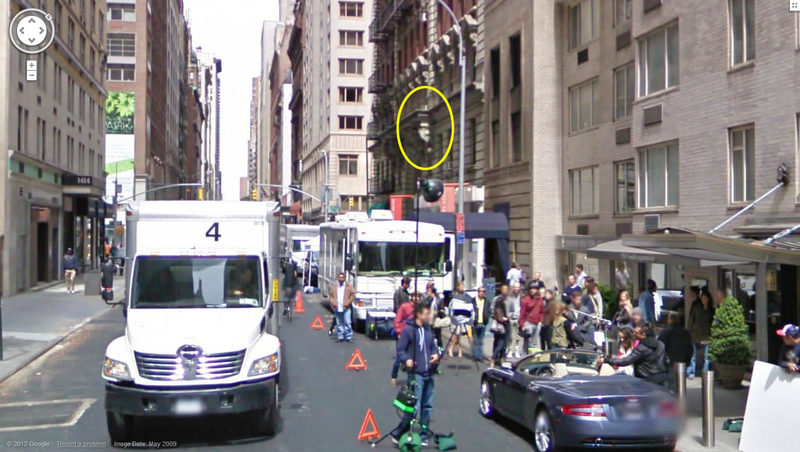 Buster most likely did not realize as he ran past the SW corner of 5th and W 58th that the same SW corner appeared in his prior feature film set in New York. But now we know what Buster knew, that two scenes from his date with Marceline were filmed on the same block, and likely the same day. This entry was posted in Buster Keaton, Harold Lloyd, Manhattan, The Cameraman and tagged Bergdorf Goodman, Buster Keaton, Harold Lloyd, Manhattan, New York, Silent Comedians, Silent Comedies, Silent Movie Locations, Silent Movies, Speedy, The Cameraman, then and now. Bookmark the permalink.